UNITED NATIONS, Jul 6 2015 (IPS) - At the first day of the Oslo Summit on Education for Development, U.N. Secretary-General Ban Ki-moon told a personal story of his experience during the Korean War, when his family “had to run for the mountains”. He spoke of how he was able to receive textbooks because of United Nations Educational, Scientific and Cultural Organization (UNESCO). Coming to the end of the 15-year effort to achieve the United Nations’ eight aspirational poverty-reduction goals named the Millennium Development Goals (MDGs), there has been some progress in achieving the second goal of universal primary education since 2000, with more girls attending school and the net enrollment rate in Sub-Saharan Africa increasing to 80 percent. However, this progress is slow and not sufficient enough. 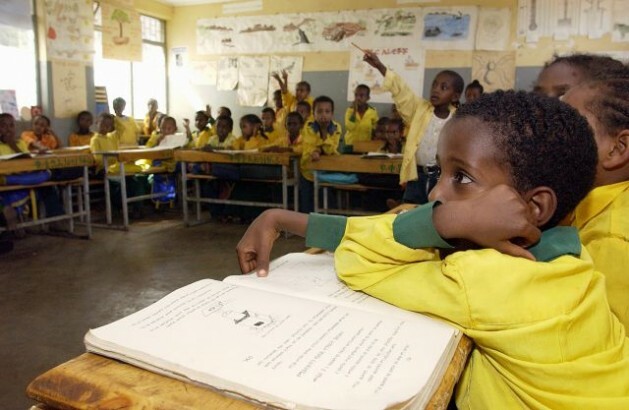 Increasing financial aid for education in poor countries is critical to meeting this MDG, as new evidence published by UNESCO today shows there is a rising number of out-of-school children (124 million), an issue serious enough to bring hundreds of world leaders to Oslo July 6 and 7. The leaders are hoping to mobilise more resources for reaching the MDGs and the new sustainable development goals for inclusive and quality education in countries affected by conflict, crisis and poverty. Today’s sessions in Oslo brought together representatives of governments, organisations, businesses, academia, media, children and teachers to discuss best options, and bring a sense of urgency to the summit. The main belief of those attending is that education is a human right and a public good, said Ms. Rasheda K. Choudhury, Vice President of the Global Campaign for Education. Education is not a commodity, Choudhury continues, but a responsibility, and this summit is not taking place as a reminder, rather to help “rethink the strategies” being used. The discussions highlighted the disparity in education between genders as well as minorities and marginalised groups. Education needs to be considered a life-saving investment in order for more humanitarian efforts and investments, said Hanna Persson, policy officer for gender, education and children at the European Commission’s Humanitarian Aid and Civil Protection department (ECHO), an organisation which received the Nobel Peace Prize in 2012. According to the final MDG report, children with mothers who have a secondary education are three times more likely to survive than those without. Urgency was placed on financing education, and the private sector was discussed as the key resource for partnerships and innovation to reach the education goals. The United Nations Special Envoy for Global Education Gordon Brown, former Prime Minister of United Kingdom, urged countries to increase aid. “While overseas development assistance increased by nine per cent between 2010 and 2013, aid to basic education fell by 22 per cent from 4.5billion dollars to 3.5billion dollars,” he noted in a statement. Spending on education is 24 dollars per child in the Democratic Republic of Congo and averages 80 dollars per child across the poorest countries, while in developed countries such as Norway, U.K., and the U.S., more than 8,000 dollars per child is spent annually. The rise in conflicts and natural disasters that have prevented children from attending school was also a main discussion topic at the summit Monday. There have not been this many displaced children since the 1940s, said the Secretary General of the Norwegian Refugee Council, Jan Egeland, yet in 2014 less than 1.7 per cent of humanitarian spending was on education.